1. Light the barbecue and allow it to reach a good cooking temperature. In a large bowl or ziplock bag marinate the lamb with the rosemary, garlic, red wine vinegar and rapeseed oil. Leave in the fridge for at least 2 hours, or even better overnight. 2. 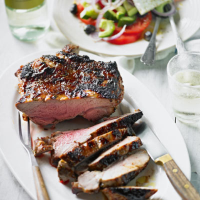 Bring the lamb out of the fridge 20–30 minutes prior to cooking, heat the barbecue to hot and sear the lamb for 4 minutes each side. Reduce the heat and continue to cook for a further 25 minutes, turning occasionally. Warm the fig jam and brush over the lamb for the last 5 minutes of cooking. 3. Remove from the barbecue and leave to rest while making the salad. 4. Place the tomatoes on a large plate, top with the cucumber, red onion, olives and feta. Drizzle with the lemon juice and Greek olive oil and finish with a scatter of dried oregano. Season with a good pinch of cracked black pepper and serve with the carved lamb.